There is nothing to craft except for rails. This mod works with any rails from any mods. To use it, right click with an empty hand the rails, magically a cart appears and you will be placed in it. Now press an direction key and off you go! To stop the motion simply dismount the cart, left shift by default, and walla walla bing bang, the cart is no more! Allows you to set whether or not to use the vanilla cart with its dependency on power and friction or the TerraCart (false) version which needs no power and is frictionless. Also removes the need to restart your server or world for this one change. I am thinking about adding wooden rails, configurable as to being enabled or not, so that you can easily get around your world. No need to ask, just add. A link back not required but sure would be sweet. Go ahead. Let me know and I'll feature it. I only ask that you link back to this page in your review description. I am Veteran of US Army. I spend a lot of time programming Minecraft assets for you greater experience. I am not disabled. Any help you can provide to continue my efforts at https://patreon.com/kreezxil will be greatly appreciated. I'm think that clicking with bare hand to actiwate minecart is bit too easy. You know, I'm propose to add a item(like a ticket or something) whose may be crafted from emeralds, redstone dust and plain minecart. And then click with this item on rail track to activate this "terracart". Of course this item and way with it may be optional and turned on/off in configuration file. That's a great Idea, please use https://github.com/kreezxil/Terracart-Reloaded/issues/3 to explain your ideas deeper. Here it's a hard to exactly explain whatever, due to this idea is really simple: All of this work like as currently, only exception is that player have to have in hand this item, when click with PPM on rail track to activate terracart. It'a all. 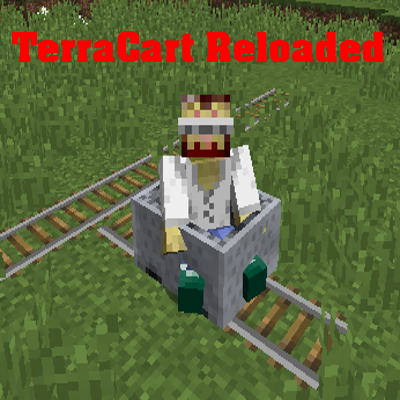 any plans to implement some sort of cart-linking (like traincarts) in this mod or another? this mod is only for providing frictionless transport for individual player transport without the need to spend iron on a cart. Me too! I even asked him in private and in the comments to update it. I noticed that according to his Curse profile he'd been active recently. I guess for whatever reason he gave up on it, thankfully it was open sourced with an WFTPL license.